Click the coloured gems to get 25 coins. Get extra food while travelling? You can hunt for food using the mini-game. This costs 30 energy. In the first part of the trail you'll only find small game - squirrels and rabbits. After Fort Kearney you'll find more. You can find food items using the search mini-game. Eggs give you 75 food and Dried fruit 100 food. Yucca gives you 200 food but you are unlikely to find it on the first part of the trail. If you earn enough XP to go to the next level your stamina will be fully restored. Try using the mini-games or helping your friends who have added you to their team. You can wait. Over time your stamina will restore at a rate of one stamina every two minutes. Know what speed to use? So if you are short of food - slow down! How can I start again? Go to the status icon (book) at the bottom right and click it. There's a 'Give up' button at the bottom right. using that will allow you to restart at Independence. You'll keep any items you've found or bought and get a minimum of 300 food if you have less than that. How do I hunt bears and buffalo? If you have the standard rifle then don't try to get bison unless you have at least 3 hearts showing at the bottom because you are going to get stunned twice probably. Bison you don't shoot won't hurt you, bears and coyotes will. Wait until bears and coyotes are almost upon you before you shoot. You need one shot only and the meat will be right next to you. 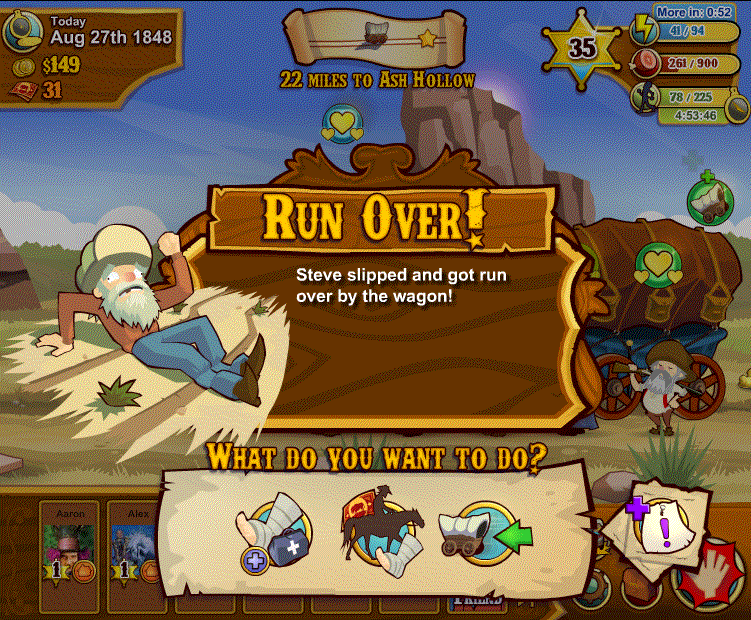 Shoot bison as they enter the screen and wait until they are almost upon you to shoot again. You will kill them with your second shot. Squirrels always appear before bears, coyotes and bison. Ignore the first one. Most of the time what you get from squirrels and rabbits isn't worth the effort UNLESS you see a very large one. That's an epic animal and worth shooting. You won't get meat from it but will see a gold box fly off the screen to indicate you got it. When you leave the hunt check your inventories. Before Fort Kearney you'll only see small game; squirrels and occasional rabbit. After Fort kearney you'll find bears. After the Platte River Crossing you'll get Buffalo and bears. At this point you can take either the upper or lower route to Ft. Laramie (same mileage 165 miles). Just make sure if you take the upper route you don't go to Courthouse Rock. - The Dalles 80 miles NB At least 5 miles before you get there try to cure as many illnesses as possible. Travel the last bit at grueling pace. I'm trying to get 'Mr Impatient'. What is the fastest route? 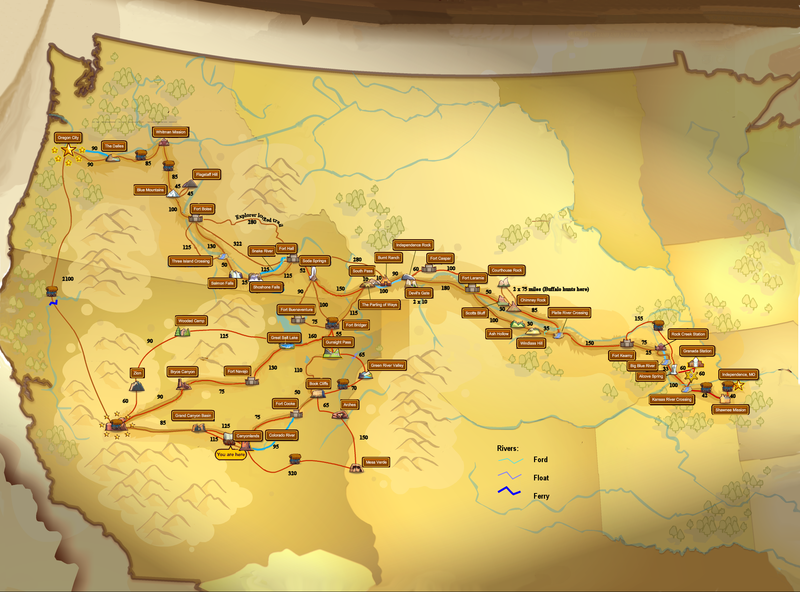 It's almost the same as the shortest route but since you would need to avoid buffalo stampedes which can delay you by 1-2 days you will need to take the slightly longer southern route from Fort Laramie. It has fewer buffalo hunts than the northern route. At this point you take either the lower route to Ft. Laramie (same mileage 165 miles). - The Dalles 80 miles NB At least 5 miles before you get there try to cure as many illnesses as possible. What is the longest route? it's now possible to go round and round the Grand Canyon section in an infinite loop so this isn't really appropriate any longer. You can also make repeated trips down the various spurs leading off the trail. Why would I choose the longest route? Because you get 1 XP for every 2 miles you travel and this raises your level. Log off from Facebook. Close down all windows in your browser then restart it. You may then find yourself connected by a different server which might be faster. This often makes the movement less jerky and fixes the problem where the cursor keys stop working during the river trips. Of course you can't do this if you have already started hunting/river rafting. I hunt but get no meat from the animals I kill. Why? As in real life you have to collect the animals you hunt. Make sure you click on the meat and collect it before the 70 seconds you have for each hunt are up. Why do I see only squirrels and rabbits when I hunt? Small game only appears before Fort Kearney. If you are hunting small game shoot several before you pick it up but keep an eye on the timer - you have 70 seconds only. Someone is snake bit - What do I do? Nothing - ignore it. They won't die unless you run out of food or their health reaches 'Critical' and do nothing about that also. Don't waste resources trying to cure it or wait for them to get better. Just before you get to a destination - say 2 miles away, stop and if you have anything which improves health use that. Then use any snake cures you have. You get more experience points for arriving with all your team healthy. What do I do about fever/cholera/scurvy/dysentery? As for snakebite - do nothing until you are a couple of miles from your destination. Then, if you have anything which improves health use that. Then use any cures you have. How do I use the items in my inventory? Click on the item, move off it. You will see a thumbs up icon. Click that. I cured someone but it still shows their health is critical. Why? Illness and injury are seperate from 'health'. If someone has an illness, injury or you have no food their health will start to fall quickly. Once it drops to zero they will die. Curing an illness/injury does not cure health. You can improve health by using any of the items shown in the 'Items to buy and find' page which increase health. Health will also improve while you are not playing the game. 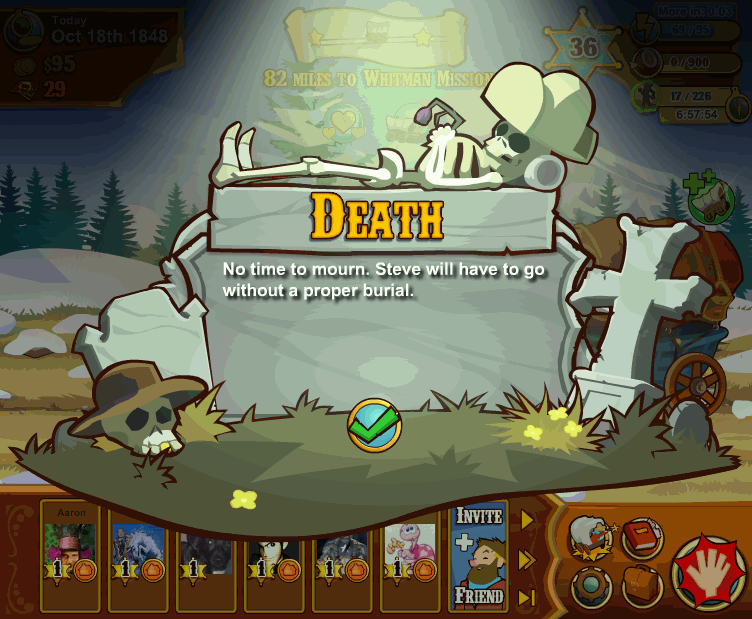 If you want to kill off your team then, don't buy food, don't collect food, don't cure anything and use food faster by running at maximum speed. How do I sell something I bought and don't want? You can only do this at a store or when you are with the Indian or Peddler. In their shop display select the item in your inventory You'll see an icon with coins appear - use that. What do the stones/geodes do? The stones have now all changed to Geodes. You can sell each one for 2 coins. If you have lots - it's probably not worth the effort since you can collect more from the trail in the time it takes to sell two of them. Keep them. How do I sell things I found? You should keep these and they will be sold at a profit in Oregon City. Buy as many as you can. If you have a choice, buy the items which stack - Cotton is a good choice. 5 of them can be put in one slot and it is not expensive to buy. My oxen are sick. What should I do? If they are really sick - just keep going but you will be slowed down. Sometimes this happens when a baby ox is about to be born in which case - great! You can sell the baby for 5 Trail Notes. Trading it for food isn't a good deal. Someone fell off my wagon! It's worthwhile going back to look for them, but not if you are getting near 20th December! When you find them they'll probably be injured. Keep going until near a destination then apply any bandages, poultices or health improving tonics. It's even possible for someone to fall off a stationary wagon and get lost! What does the spyglass do and where do I get it? If you are traveling as an explorer it will reduce the energy cost of the mini-game search to 11. That's why so many people travel as explorer. The spyglass's effect stacks with the survival skins so searches can cost as little as 8 energy. You MUST travel as the explorer to find it. Look out for the Peddler. She will often be near Oregon City if you are an explorer. If you don't find her by the time you get to The Dalles then take the road route to Oregon City. Pay 1 TN to see her special inventory and you'll find the spyglass in the tools section. It will cost you a further 15 TN. What do I spend my Trail Notes on? 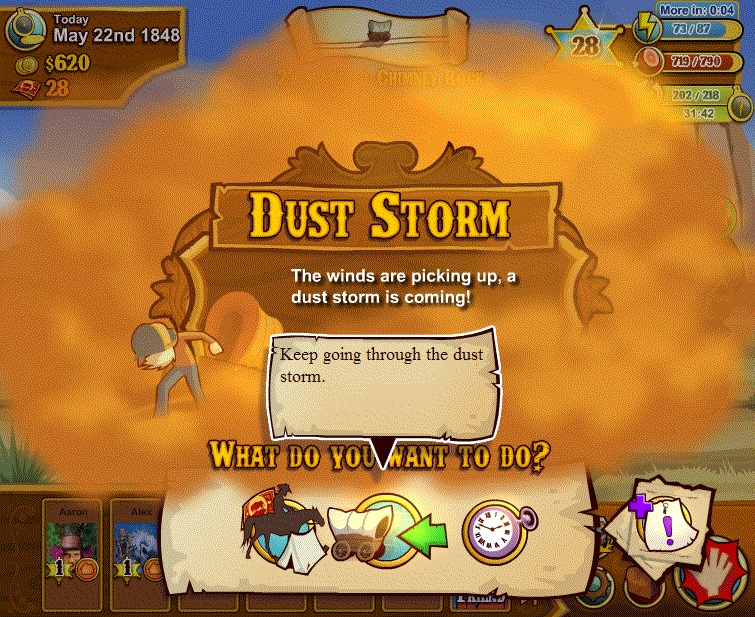 I'm in a dust storm - what should I do? Keep going. You will be slowed down but the other options cost you time. One of my team got run over. What should I do? Keep going. It's a little odd to see 'Steve' running or walking with a broken leg but wait until you are almost at a destination before you attempt a cure. Cure him/her with a bandage or poultice. One of my team died. What should I do? This means you've run out of food or their health reached 'Critical' and you did nothing! If you don't get more food immediately/attend to the health of the rest of the party then more of your team will die. 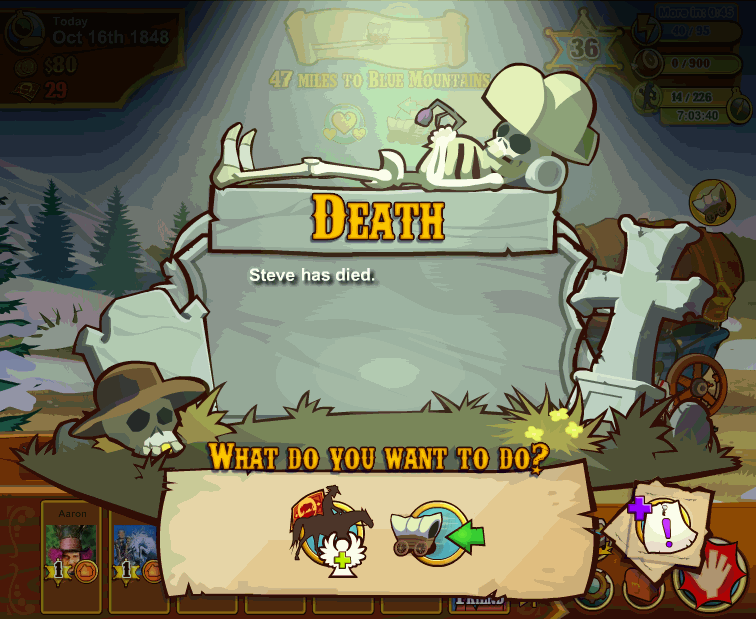 Choose to continue but click the mini-game icon straight away and go hunt for more food. What do the apprentice and journeyman's tools do? 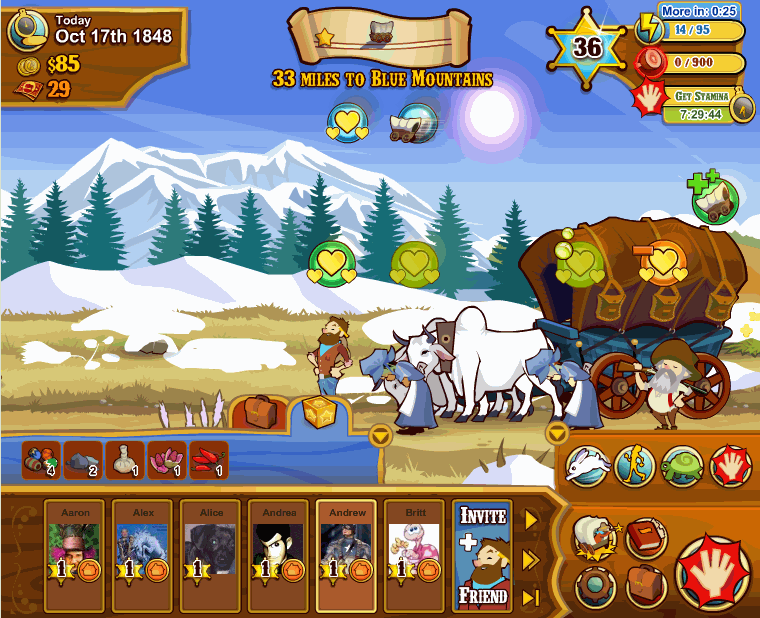 The apprentice tools add to the rate at which your wagon is repaired when you play the repair mini-game. (10%) You may not notice this. The journeyman's tools do the same thing but at a rate of 35% - definitely noticeable. Something I bought went missing. What happened? Items you buy for coins can be lost crossing rivers, during flash floods and to bandits. The actual items lost used to be always the first cash bought item on the left of your inventory and the solution to this was to put something which costs little in this slot. Lemons are ideal. You can stack 10 lemons in one slot. Now, the item chosen could be anything you purchased for cash. It's still a good idea to keep well stocked up with lemons and any other low cost items. If you run short of inventory slots then sell an inexpensive item to make room for what you want to buy. How do I move lemons to the leftmost inventory slot/move stuff in my inventory? This is no longer worth doing but I've left it here since it explains something about the banker. Find a store which sells the item/s you want to move to the right of the lemons. Select the item in your inventory, and click the coin which appears to sell it. If you are NOT traveling as a banker, this will cost you money! Is there a bigger map anywhere? Have another question? Ask it in the comment below.